Sleep Apnea Test: The Best Sleep You’ll Never Have! I already know that I have sleep apnea, which is known as “a common disorder in which you have one or more pauses in breathing or shallow breaths while you sleep”. I know I have this, not just because my sleep doctor said so, and not just because several people related to me have it, but because I’ve felt it. When I’m lying on my back, if I let my jaw and throat muscles relax, my throat closes right up. Whenever I accidentally end up sleeping on my back, I have dreams that I can’t catch my breath – then I eventually wake up, and realize I’m barely breathing. It’s scary and takes a few minutes to shake off that suffocating feeling. Luckily, I rarely sleep on my back. This past week, I finally did a sleep study at the hospital to find out whether my tendency to not-breathe applies to my stomach/side sleeping. I’m really hoping it doesn’t, because as much as Sean and I love his robot face, I don’t fancy the idea of his-and-hers CPAP machines. I had heard that they hook you up to a bunch of monitors. Well, of course they do, because they have to monitor many things. I figured it would be uncomfortable. I thought I was mentally prepared. I took my unsuspecting self to the lab for 8:15 p.m., waited a bit, answered some questions, and was shown to my cute li’l windowless room. Just large enough not to trigger my claustrophobia, so that was nice. The sleep therapist was working with several patients that night; she instructed me to fill in some more forms and put on my sleep clothes, so that when she came back I’d be ready for my monitors. I asked if I should brush my teeth first, and she indicated that it didn’t matter. Tip #1: It does. For the love of healthy gums, brush your teeth first. When the therapist arrived to hook me up, she was generally friendly. We commiserated about having interrupted sleep due to children – she has a toddler at home. She told me that they’d be able to tell when I was sleeping lightly or deeply, and whether I had restless leg syndrome or anything. At the same time, she was not-so-gently exfoliating bits of me that would have wires and medical tape applied to them: my chin, my forehead, my shoulders, my chest, and both my shins. There were now wires coming from the top of my head, my hairline, and behind my ears, in addition to the ones under the tape, which was starting to sting a little. I also had a strap around my chest and a strap around my stomach. Then she stuck not one but two contraptions up my nostrils, looping the tubes over my ears and tightening them elegantly under my chin. As a finishing touch, she took the little box attached to all those wires, and looped it on a strap around my neck: voilà! So chic and fancy. This box-as-pendant look was to make me mobile, so I could journey to the washroom during my final wait time. I waited as long as I could for this, hoping it would be the only trip. Tip #2: Ideally, you should wear an old-fashioned knee-length nightshirt for this. Something about the rest of my getup made my nightshirt feel too short as I schlepped down the hall to the bathroom. This was also when I brushed my teeth, gingerly, between the nose thingies and the chin wires. Looked and felt like a tool – and frankly, didn’t do the best job. Then I spent my last bit of idle time reading a book – nonchalantly, amidst my electronica – on my bed. Finally it was bedtime. The therapist had me lie down and take off the wire box to lay it beside my pillow. Then I got one more accoutrement: a finger clip sensor. This was the only thing she warned me about: “Try not to put too much pressure on it.” Now I was locked in: if I needed a bathroom break, I’d need to push the call button so she could unplug me. I had been worried about the room being too dark for me: if I can’t see my hand in front of my face, the claustrophobia kicks in. I needn’t have worried. Besides light from under the door, my monitor and finger clip glowed red. So did the video monitor on the wall. The therapist’s voice came over a speaker to give us sleepers some instructions. She asked us to look side-to-side with our eyes only, and up-and-down; to flex and point each foot; to grind our teeth; to breathe in certain ways. At one point, she said, “Now breathe in, hold your breath, and while you’re holding it, move your stomach up and down.” I grinned silently at myself to stifle a laugh at how dumb I felt figuring this one out (and I’m a belly dancer). Tip #3: Come on, Di-hards, give it a try. Just in case you need this skill someday. It’s a brain-teaser. Finally, we were done our exercises, and reminded to sleep comfortably – no restrictions on our positions! – and bid a good night. Time to sleep. If I were to make a list of soporific things, I can now say with certitude that being covered with wires does not make that list. Ditto being surrounded by glowing red things. Ditto knowing you are being recorded on video. Ditto knowing they are surveilling all kinds of personal things, like your nostrils. I typically take a fair amount of time to fall asleep. I also never sleep well on my first night in a strange bed. Now I just lay there, thinking about how intimate this test is. The therapist said they’d be able to tell when I was dreaming – could they tell whether my brain was thinking about boring things or exciting things? Could they tell that I was singing and doing choreography in my head (to take my mind off the wires)? I realized I was twitching my foot in time to the music, and quit the mental song-and-dance in case they thought it was a restless limb. Could they tell with those straps that my bladder was filling up? I had been confident I’d be fine on the pee-break front, but no. Not with a call-button looming. It’s like getting all put together in your belly dance costume or your wedding dress: when it’s most inconvenient, that’s when you’re gonna have to pee. Sigh. On my break, I saw that it had already been an hour since “bedtime.” Only six hours until they would wake us up. Better get sleeping. I felt kind of odd filling out the form about how to improve the experience of the sleep study for patients. There’s really not much they could have done, since they can’t do away with the wires or the blue goo or the video camera. I did say I wished wakeup time hadn’t been 5:30 a.m., though. It was a beautiful summer morning as I left the hospital as a gluey-haired zombie. I came home to the most beautiful bed in the world, which I fell into – right after the showering part. (The glue really wasn’t that bad, once I got the chunks out.) In a few weeks, I’ll get to chat with my sleep doctor about my unforgettable night at the lab. I suppose, in the grand scheme of things, a robot-face wouldn’t be that bad. Ever since Robbie had his first sleep test I’ve wondered how the data can possibly be considered valid, given the artificiality of the circumstances. He had heavy traffic noise outside, too, which was quite unlike Philip Place in Ancaster. But for you I’m really, really hoping for good news from this! Yeah, I’m now hoping that at the very least, they got enough sleep out of me to say that I’m still breathing in my normal(-ish) positions. Since an accurate analysis of my overall sleep quality is just not happening. Ugh! Sleep studies! I sympathize. I really really hope you get happy news back. If you don’t, or it’s inconclusive, I suggest getting a second opinion on the results. My sleep doctor turned out to be a medication-trigger-happy idiot. I had to do a lot of research on my own to figure out that all my nose/throat issues were to blame for my sleepiness. There’s so much we don’t know about sleep. How exhausting! Good luck, Di. The robot-face at the end made me laugh. It’s good you can see this situation with a bit of humour. 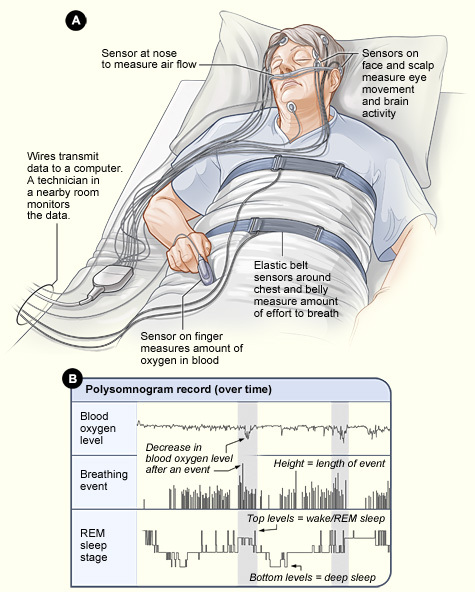 Sleep studies might not provide complete data on your sleep and seriousness of sleep apnea, but it’s still helpful. It’s essential to consult with your doctor (and do some research by yourself as well of course + get a second opinion like Quinn said), it’s crazy how many people with sleep apnea don’t do anything about it. Thanks for reading, Liz! You’re right, it really is upsetting to think how many people might be lacking sleep/oxygen on a daily basis… I can’t count the number of times I’ve listened to complaints from someone whose spouse snores terribly but has never had a test to check for apnea. I always tell them about how helpful my husband’s CPAP has been!